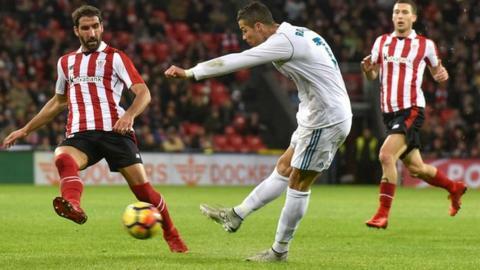 Karim Benzema and Cristiano Ronaldo both hit the post while Sergio Ramos was sent off as Real Madrid were held at Athletic Bilbao. Zinedine Zidane's champions needed a win to reduce the eight-point gap on leaders Barcelona, who drew 2-2 with Celta Vigo earlier in the day. But Real were frustrated and efforts from Benzema and Ronaldo, with a clever volley, were as close as they came. Real finished with 10 men after Ramos was dismissed for two bookings. Ramos, dismissed for the 19th time in La Liga, had been booked for a foul on Raul Garcia when he caught Aritz Aduriz in the 86th minute and received his second yellow. Real keeper Keylor Navas produced fine saves to keep out Inaki Williams and Aduriz. This time last year Real were at the top of La Liga on 34 points from 14 games after Ramos' last-minute equaliser at Barcelona in El Clasico. The point in the Basque Country left them fourth in the table on 28 points from the same number of games. Real's next game is at home to Borussia Dortmund in the Champions League on Wednesday (19:45 GMT). Match ends, Athletic Club 0, Real Madrid 0. Second Half ends, Athletic Club 0, Real Madrid 0. Attempt missed. Raul García (Athletic Club) right footed shot from the right side of the box misses to the left. Assisted by Iñigo Córdoba with a cross. Cristiano Ronaldo (Real Madrid) is shown the yellow card for a bad foul. Corner, Athletic Club. Conceded by Casemiro. Second yellow card to Sergio Ramos (Real Madrid) for a bad foul. Aritz Aduriz (Athletic Club) wins a free kick in the attacking half. Attempt missed. Cristiano Ronaldo (Real Madrid) header from the centre of the box is close, but misses to the left. Assisted by Marcelo with a cross. Attempt saved. Cristiano Ronaldo (Real Madrid) header from the centre of the box is saved in the top left corner. Assisted by Marcelo with a cross. Mateo Kovacic (Real Madrid) wins a free kick on the left wing. Substitution, Athletic Club. Iñigo Córdoba replaces Iñaki Williams. Substitution, Real Madrid. Borja Mayoral replaces Karim Benzema. Substitution, Real Madrid. Mateo Kovacic replaces Isco. Corner, Real Madrid. Conceded by Mikel Balenziaga. Attempt missed. Marcelo (Real Madrid) left footed shot from outside the box misses to the left. Attempt missed. Casemiro (Real Madrid) right footed shot from outside the box is too high. Assisted by Luka Modric. Attempt saved. Marcelo (Real Madrid) left footed shot from a difficult angle and long range on the left is saved in the centre of the goal. Assisted by Karim Benzema. Attempt missed. Raul García (Athletic Club) header from the left side of the box misses to the left. Assisted by Markel Susaeta following a set piece situation.